South Korean swimmer Yunhui Kim (middle) with sisters Min Jeung Kim (left) and Glovia Kang during the official opening of Junior Pan Pacific Championship at Damodar Aquatic Centre in Suva on August 21, 2018. Photo: Ronald Kumar. South Korea national youth champion, Yun Hui Kim considers herself lucky to have her sisters in Fiji for the 2018 Junior Pan Pacific Champion­ship which begins at the Damodar Aquatic Centre, Suva today. The 14 year old said being her first visit to Fiji she is excited to be among swimmers from around the world. Kim said being the lone athlete from her country she will do her best for her country. “I am the only swimmer in the family and very lucky to have my sisters who came from Korea and Australia here to support me. 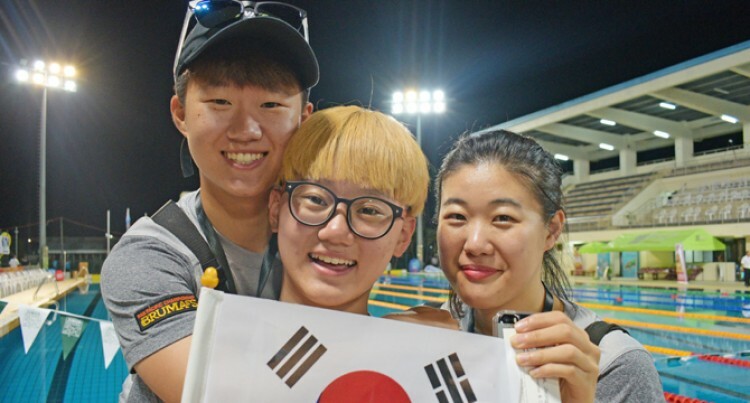 “My aim for the Junior Pan Pacs is to clock a personal best,” Kim said. Kim added this is her first trip to Fiji and she is enjoy­ing the atmosphere and the people. Kim’s favourite event is the 200 metres butterfly.